Tube steps for the new 2007-2012 Wrangler are custom designed for the oversized features of this hot new vehicle. Unlike smaller tube designs, these large oval and round tubes provide a much cleaner look and are not “dwarfed” by oversized tires and body style. Rugged Ridge Stainless Tube Steps feature prime 304L, .05” wall stainless tubing polished to a mirror finish. The polishing process for a Rugged Ridge step is longer and deeper pulling out the deepest shine from the steel. A true “deep polish”! Rugged Ridge painted steel Tube Steps feature special E-coated, .07” wall steel that is “thick source” powdercoated for a tough chip resistant finish. The special E-coat undercoating provides double rust protection as it bonds to the metal creating a protective layer found no where else. 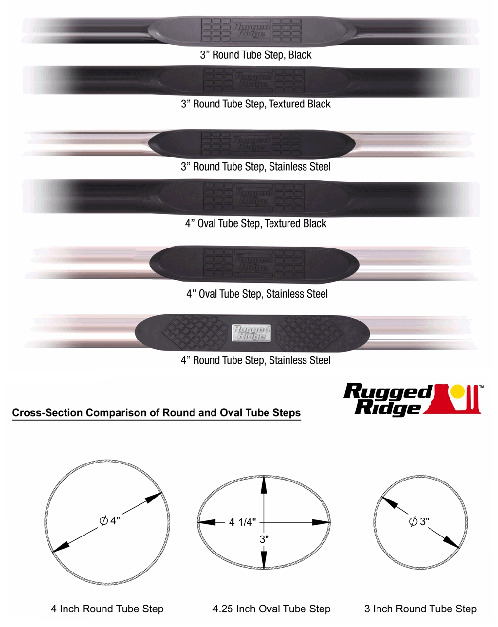 All Rugged Ridge Tube steps feature no-drill installation for ease of installation and a truly custom fit.